Hello! It's Allison from Stuckey in Second. 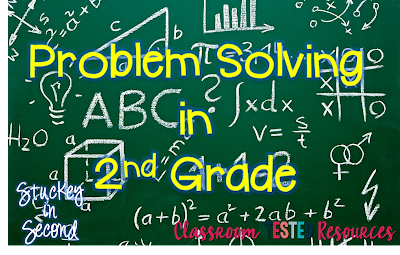 I've been thinking about how I want to continue math problem solving skills with my second graders next year, and maybe even add a little more rigor to what I've been doing. 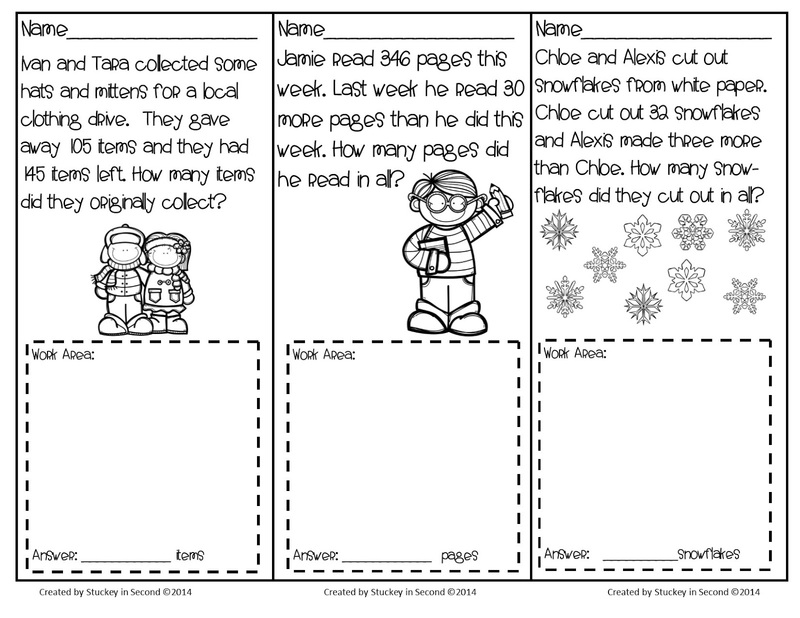 I seem to modify things each year, as all teachers do. This is just a quick post about how I do things in my classroom. Maybe this will help someone else out! We use Envisions for our math series and I don't think it gives my students enough problem solving practice. (I'm sure that other math sets are like this too, do any of them have EVERYTHING?) 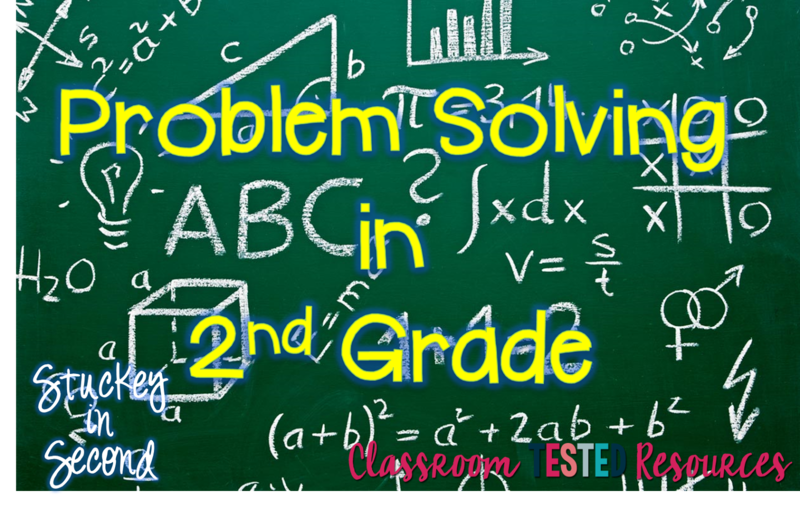 It does use "story" problems, but when I think of problem solving, I'm thinking of more multi-step problems that really adds some rigor to the math block. Our math block starts right after lunch, so I have a procedure set in place that I have a problem solving problem on my students' desks when they return from lunch, and they know to get out their math notebooks, glue the problem into it, then solve. This is meant to be a pretty quick assignment, to do as a warm-up before we begin our math lesson for the day. I like to have them glued into the math notebook because it shows growth through the year, instead of them just shoving them in a folder or taking them home to never be seen again. Since we do these everyday, they aren't always SUPER rigorous (but more rigorous than what I see in Envisions usually). Some of the problems can take more time than others and sometimes we HAVE more time than other days. I copy the problems in a way that they are small enough to be glued into the notebooks easily and to save paper! I have used many resources for math problem solving in my classroom, but sometimes I found myself digging through the different problems to find one that they could do that day without too much direction, as they are supposed to start on it right away when they get in the room. So, this year, I decided to create my own monthly sets of problems. I created them as the year went on, by looking ahead at that month to see what we would be working on, but also adding in some review of things we have already working on. I love having this warm-up everyday that goes along with what we are working on and reviewing things we have worked on before. It's a lot for some students at first, but as the year goes on, they all grow tremendously! An example from my January set. 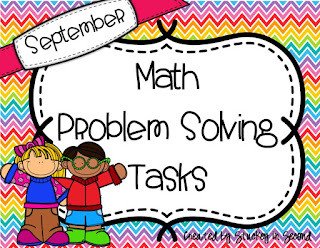 If you are interested in checking out some of these problems, here is my September/Back to School themed set. 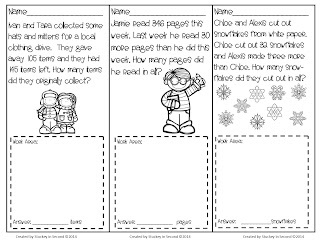 This set focuses mostly on addition and subtraction, which is what we work on first! I forgot to add earlier, there are 21 problems per set. Enough to get you through the school days in each month, and sometimes you will have a few extras so if one doesn't work for your kids, you can ditch a few. Thanks for sharing your problem solving ideas for second grade. Getting kids opportunities to review, apply and discuss really boosts their understanding of math. This looks like a great product. Love this idea and wanted to suggest extending the activities with a little technology twist for those of us who integrate tech in the classroom. These are suggestions that would engage students on a deeper level in conversations...create a video explaining their thinking process and using various math manipulatives or apps. You can then upload the videos to various apps such as Explain Everything, ShowMe, Educreations or even YouTube to share with parents, other classooms, etc. This would also be a great way to see growth in students thinking from the beginning to the end of the year!